I really like the colours, soft with a little hit of red. 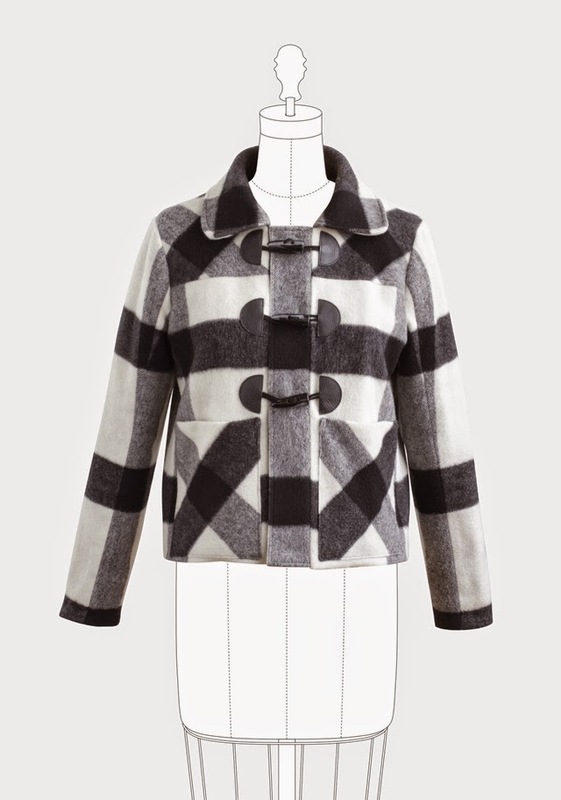 I like the pattern too- geometric but still sketchy and not too rigid. A large selection of Ellen Luckett Baker's new Charm's range have just arrived including this stunning half round metallic print. I would love this for a bag. Anna Graham's new collaborative design with Heather Bostic, The Caravan Tote and Pouch pattern, would be the perfect pattern for this. If you are similarly inspired, Eternal Maker stock leather look bag handles here, and spotty handles here. Other bag hardware can be found here. 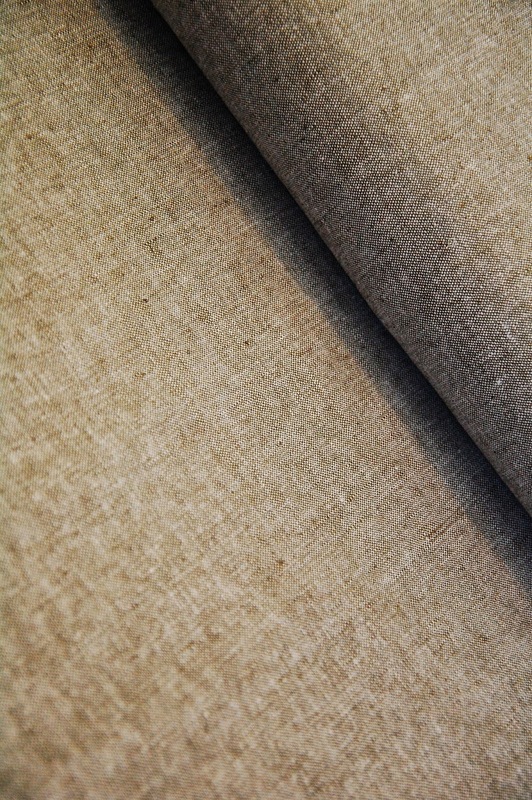 I would pair the metallic scallop with this olive linen/cotton yarn dyed blend from Robert Kaufman. 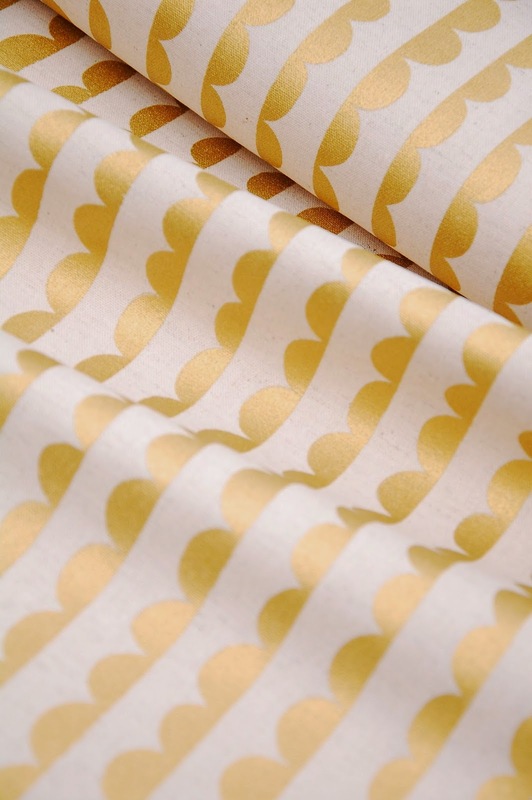 If you fear the metallic, the same scallop print is available in mustard (no sparkles), and charcoal. 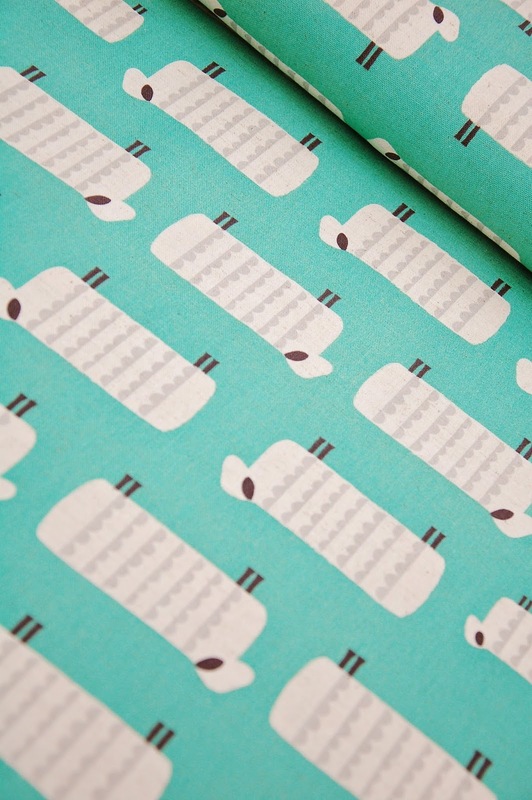 And for those of you who like a cute animal combined with a soft geometric, the sheep print in mint is pretty darn cute. This picture (owned by Eternal Maker) gives you an idea of the relative scale of the 'Charms' prints and others in the range. 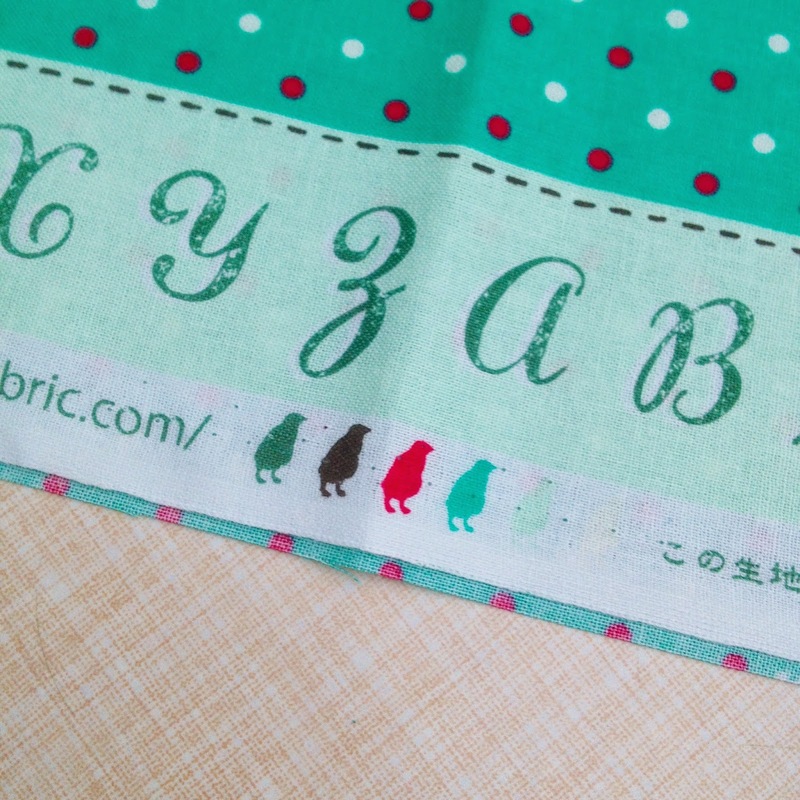 Arc bird comes in four colour ways so as well as the yellow/green you can find pink, blue and purple. 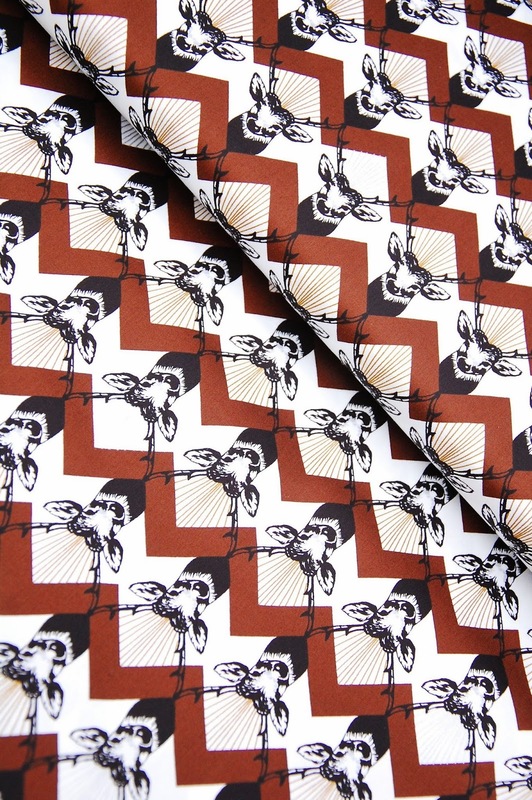 I felt I had to show you this Buck Chevron print too, classic Echino! 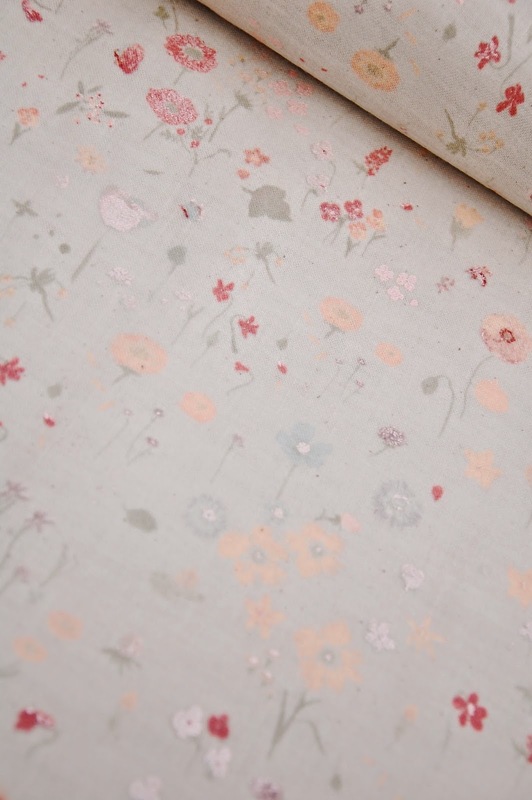 This is in cotton sateen. 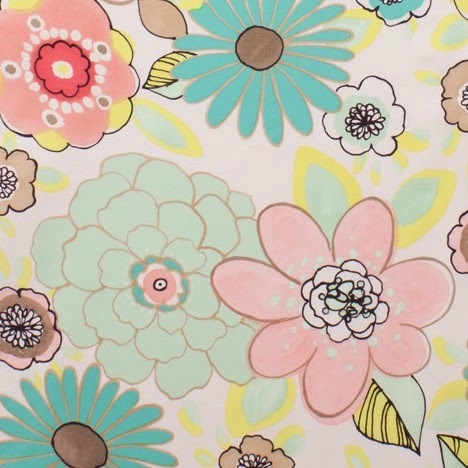 Amy Butler's Violette collection is full of spring and even summer optimism and has some wonderful colours and prints. French Twist is a favourite. 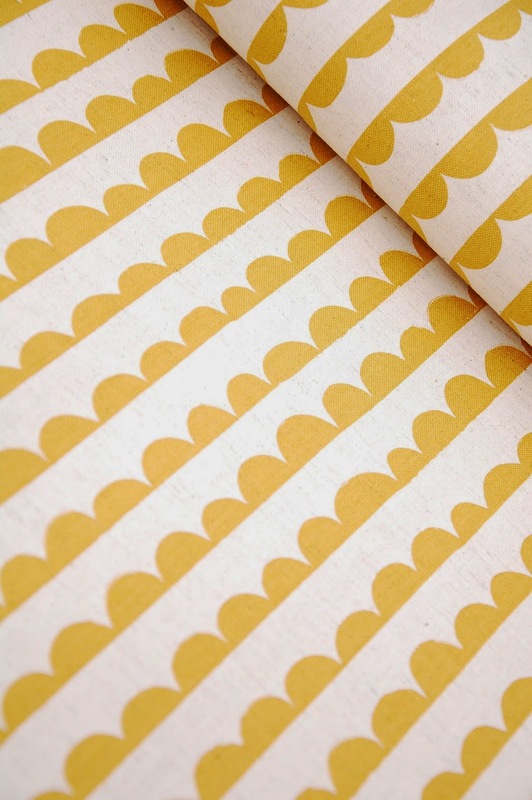 I'll end this month's selection with one of my long term favourite designers, Naomi Ito for Nani Iro. 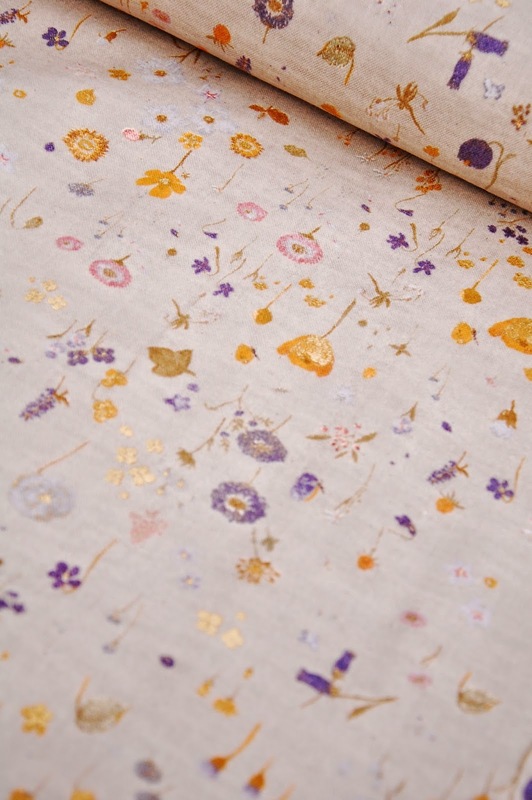 Some brushed cotton versions of her Sen Ritsu floral print have arrived and the combination of soft warm fabric, delicate flowers and the tiniest amount of sparkle is perfection. 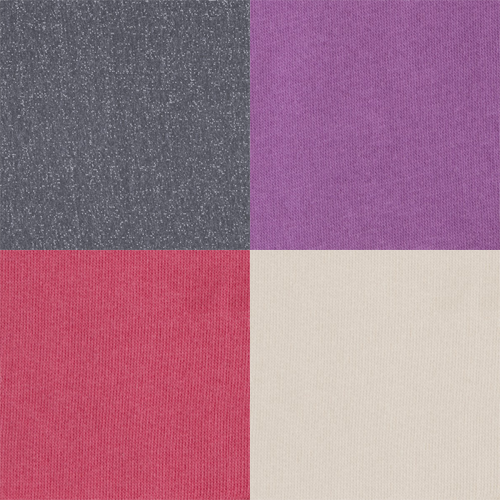 Dresses, PJ pants, tunic tops, shirts, quilts, whole cloth blankets- all work well with this brushed cotton. Sen Ritsu in Mole gray and Sen Sen Ritsu Pale Grey brushed cotton. For a frequent dress maker, I have a modest number of patterns. 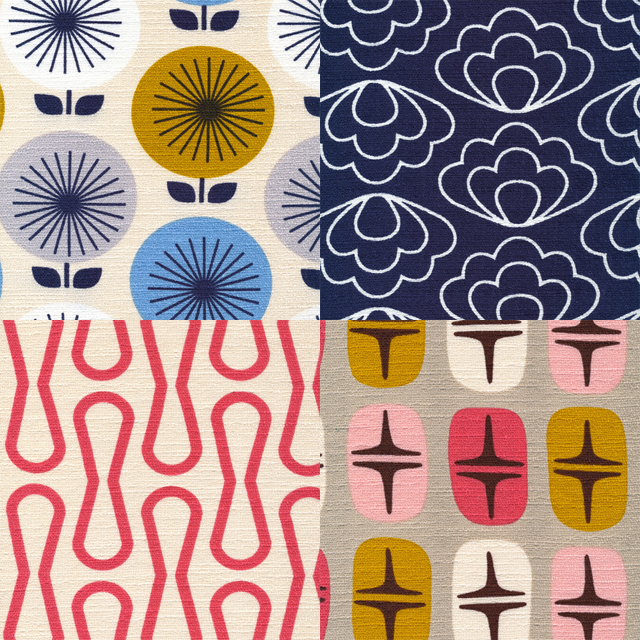 I tend to keep only what I will realistically make, patterns that are my size or close or the occasional patterns that is so beautiful/kitsch/of its time that I feel bound to hold on to it. 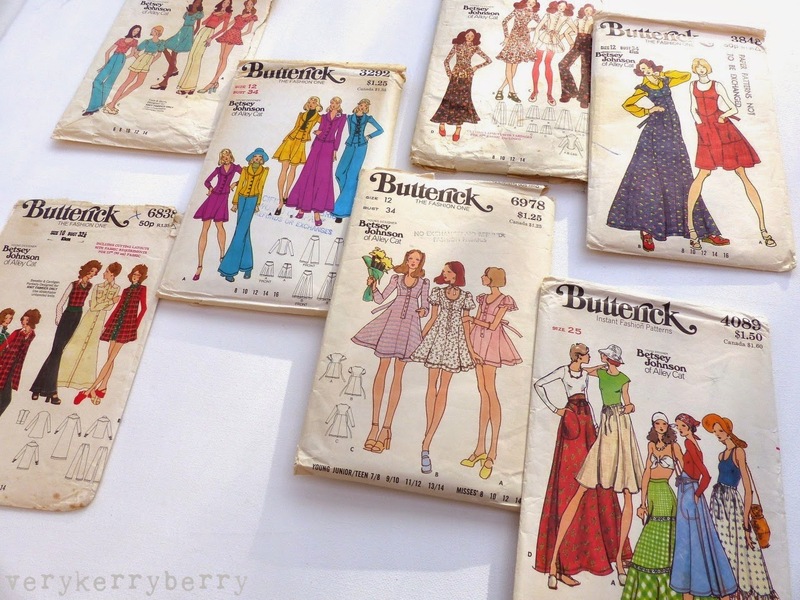 I have more vintage patterns than modern and my favourites are from the 1970s. I was born in 1970 so the aesthetic is one I grew up with and I like a little homespun ditsy prairie look with a nod to 1940s and 1900s so Betsey Johnson is my perfect pattern designer, this is my collection. 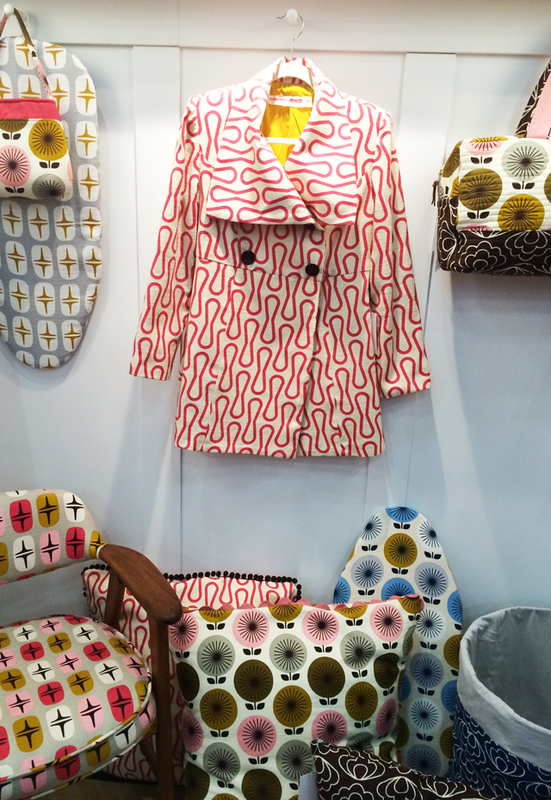 Lots of the big name pattern houses featured young designers in their seasonal collection. 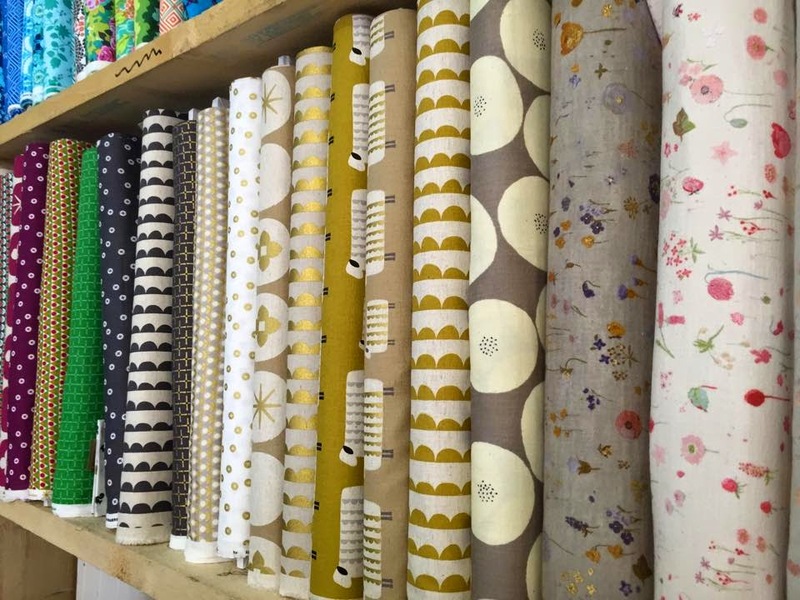 There is an excellent blog post here showing Buttericks range of young designers, collated by vintage enthusiast and collector Lizzie Bramlett- she now blogs at The Vintage Traveller. I have been collecting mine from Etsy and Ebay for a few years. 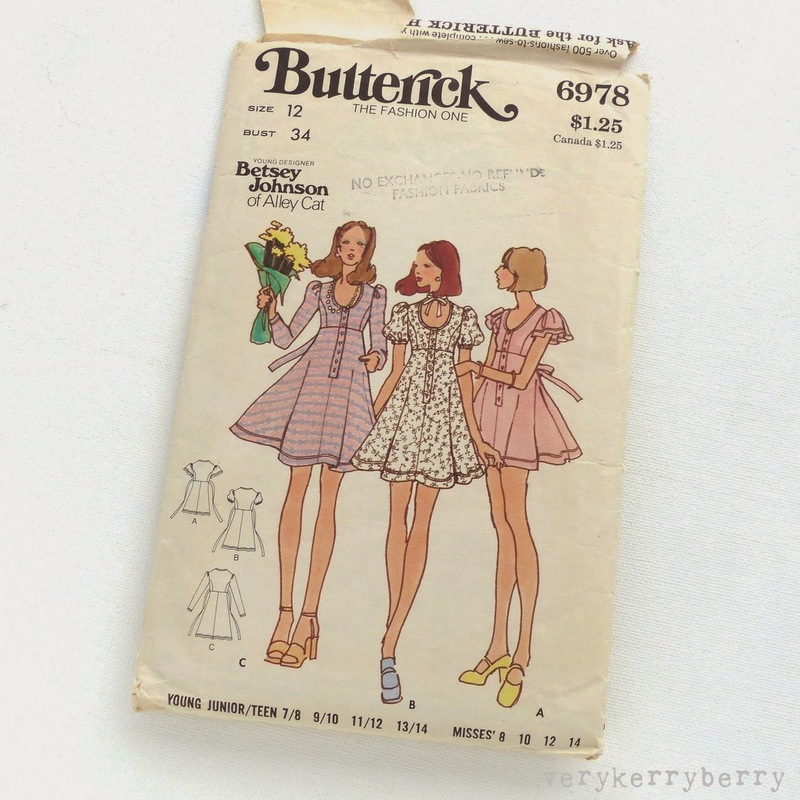 Butterick 3292 was my missing link, a pattern that I had seen here at Gold Country Girls a while back in a glorious three part feature on Betsey Johnson at Butterick, had to have and was scouting around for ever since. I randomly came across it recently in Canada on ebay and stayed up for a late night bid. I was prepared to pay big bucks but I got lucky, no one else bid and it was under £5. What can I say? I love them all, every item, the colours, everything about it. I have some mustard corduroy on order and plan to make the jacket first. Butterick 6535 was another lucky purchase. 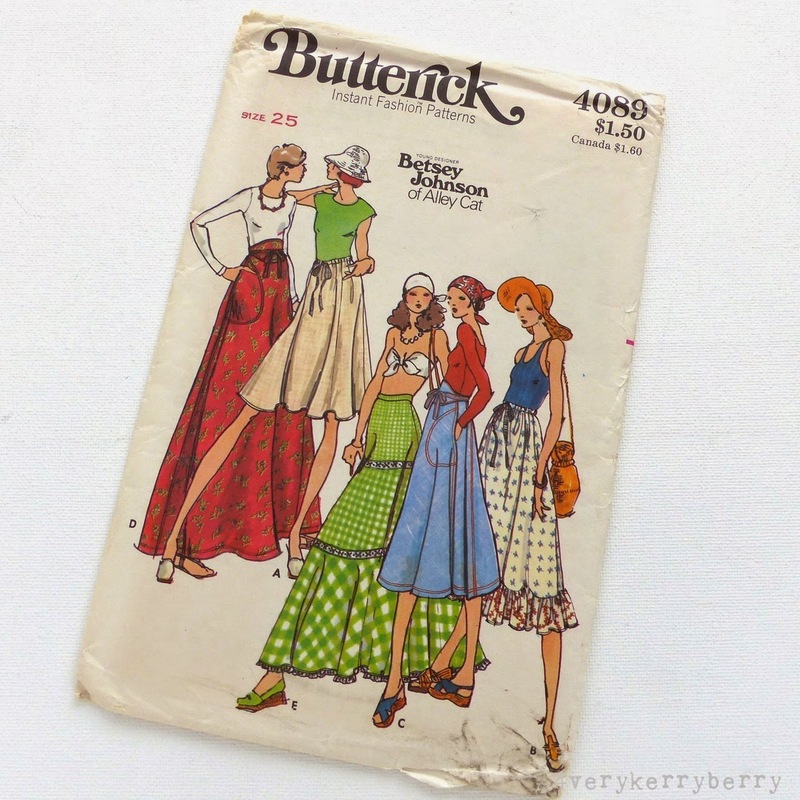 I bought it with a couple of other designer Butterick patterns for very little- again on ebay. 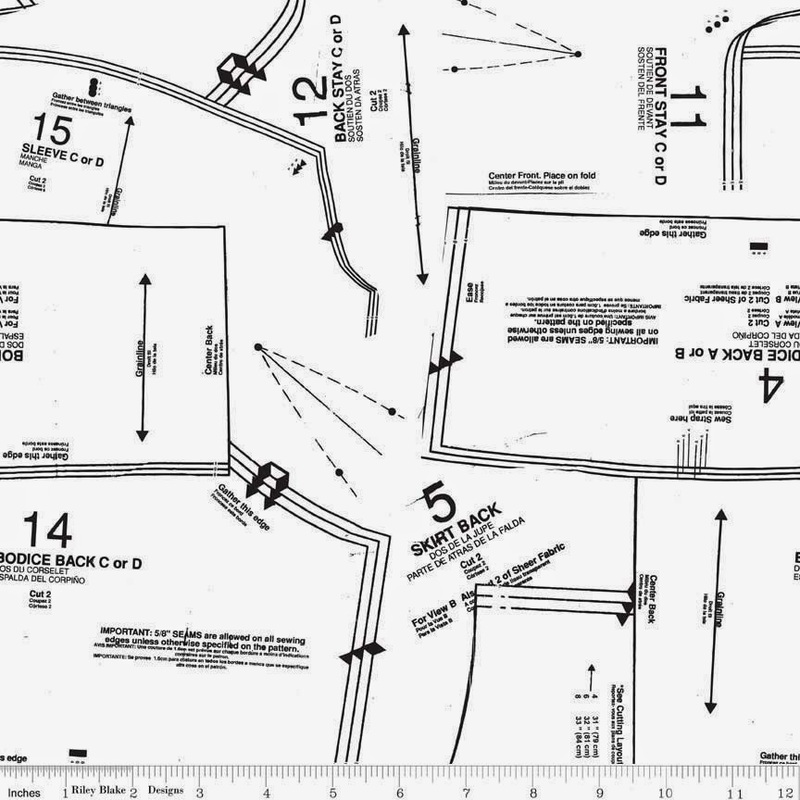 There are no instructions but the cutting layout and all the pieces are there. The shirt and maxi skirt would be my choice on this one. You can see them made up for the original pattern promotion here. I think this was an Etsy purchase on a bit of a whim. I do like an Empire neckline and princess bodice- both features that work well for me. I am not usually a short dress wearer though. 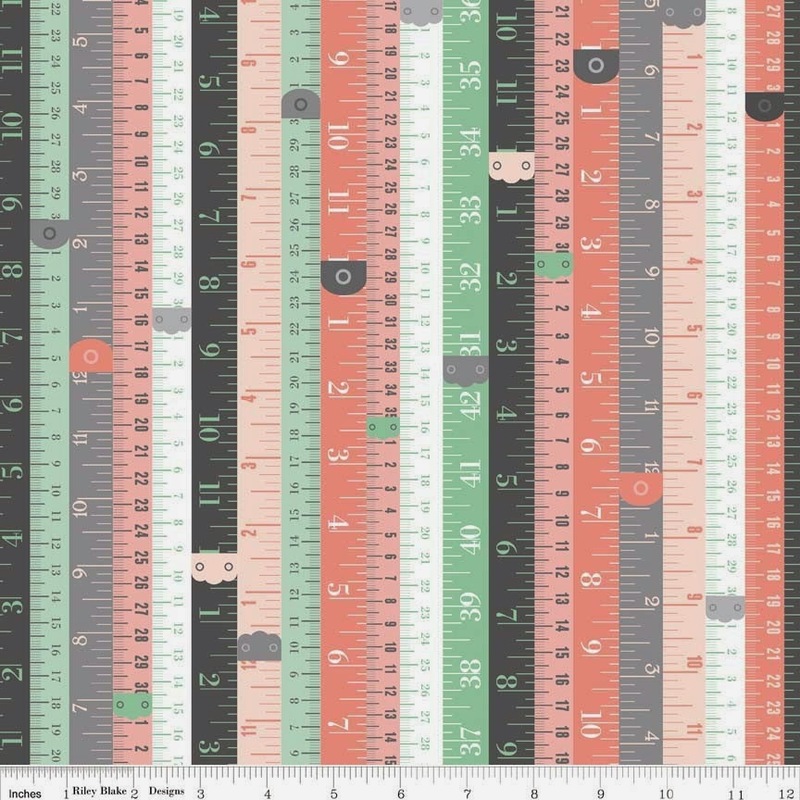 I would have to lengthen this but that is easily doable. The shoes remind me of the new Orla Kiely range for Clarks. 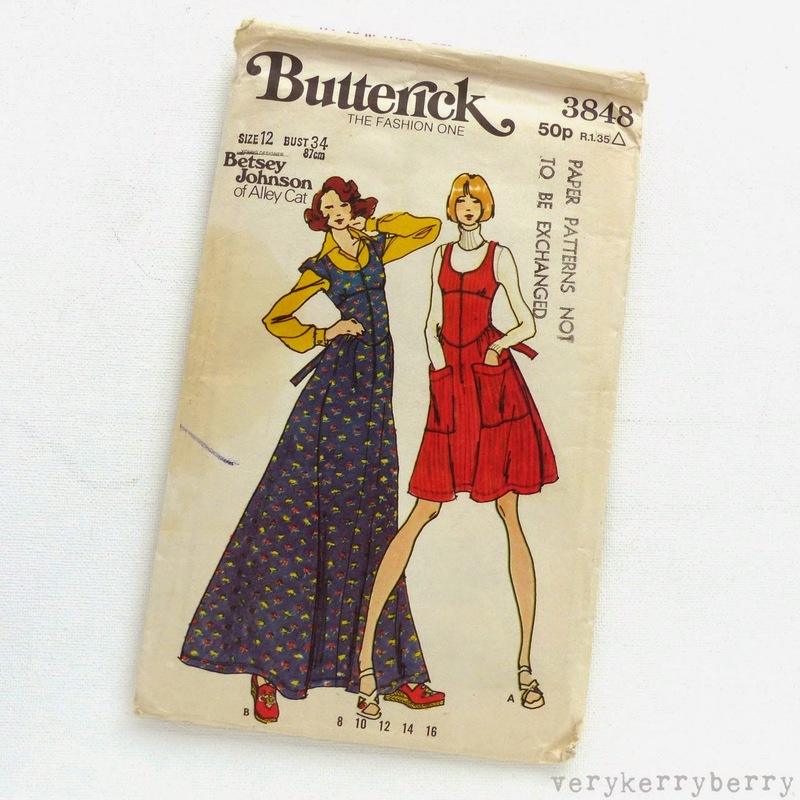 I bought Butterick 3848 from Etsy last year- maybe around £10. When I took part in Me-Made-May'14 one of the highlights on the Instagram tag feed was a photo posted by someone who made and wore it first time round. I have made view C wrap skirt (longer length) of Butterick 4089 and have worn it extensively. I was inspired by Ruth's version and she inspired me again with her broderie cotton lace interpretation of skirt E. This is a pattern I shall definitely revisit. 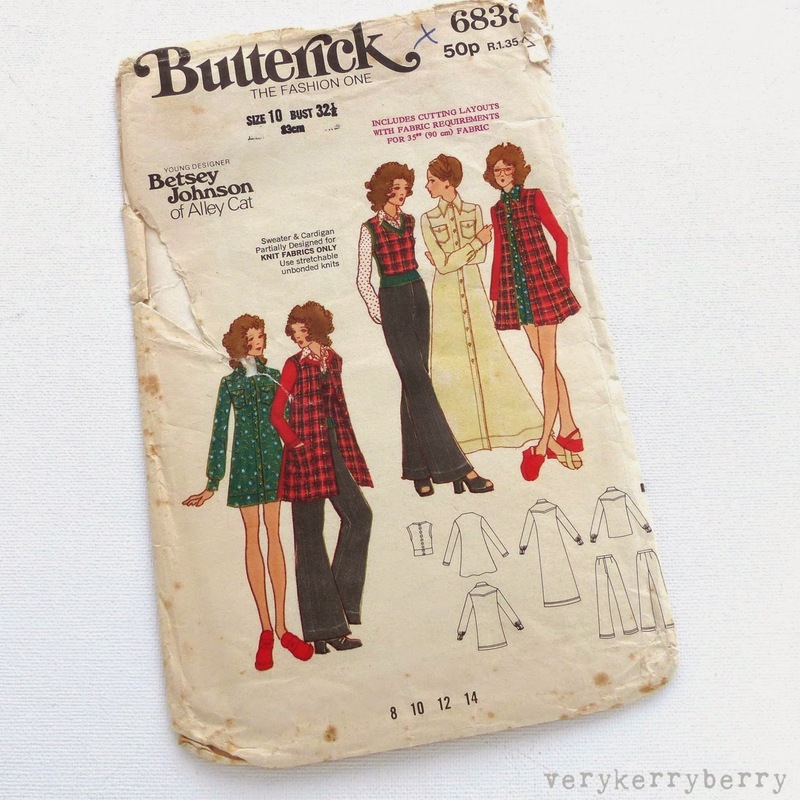 I can't remember where Butterick 6534 came from but I do know that I didn't pay much for it and I see it for sale at a high price tags- £15-20ish. 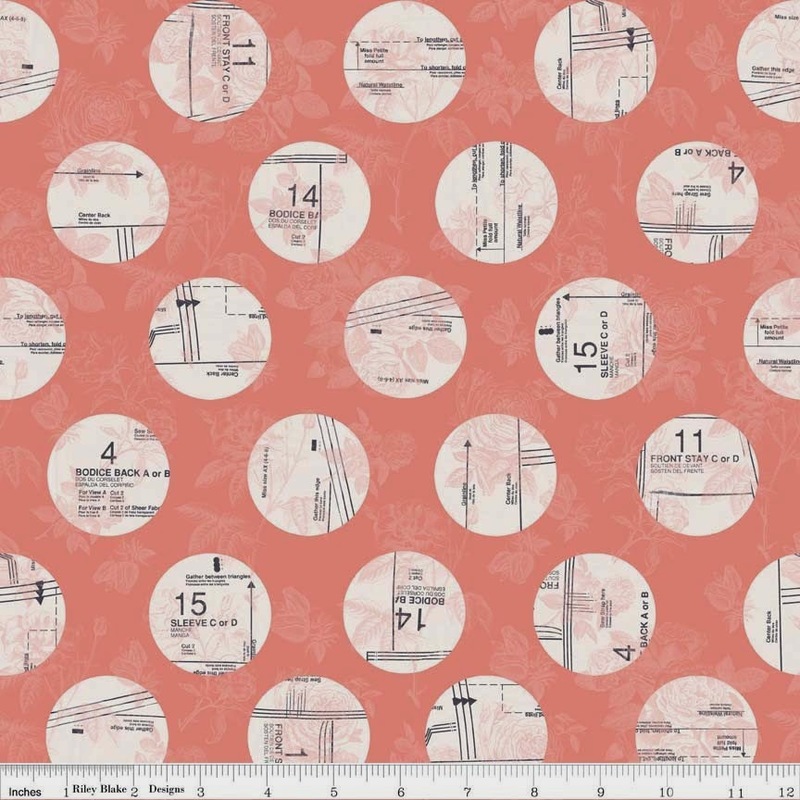 You can see these patterns sewn from the original catalogue here. 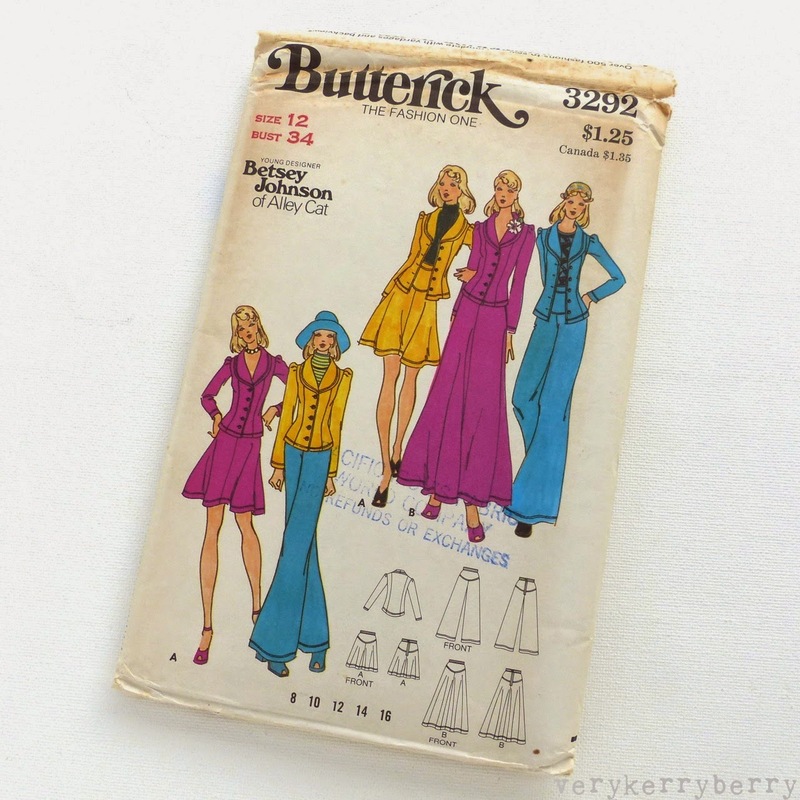 Betsey Johnson produced a lot of stretch knit patterns for Butterick. These tops are high on my to do list. I might lengthen them a little but I have used the pockets before and they are a really cute addition to a top. Butterick 6838 has a rather fragile envelope but the contents are complete. 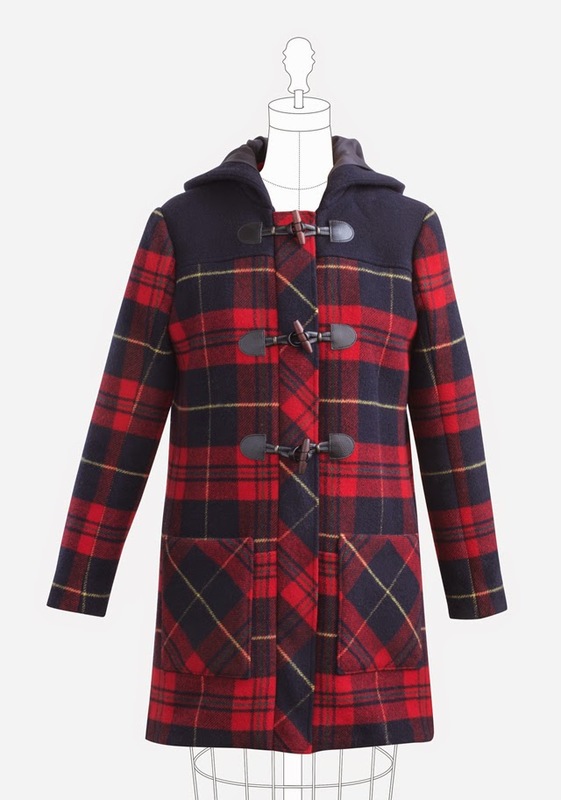 I am a little unsure about the long knit coat/jacket option, and I wonder how successful the tank top would be but the shirt shape is good with great yoke details front and back. 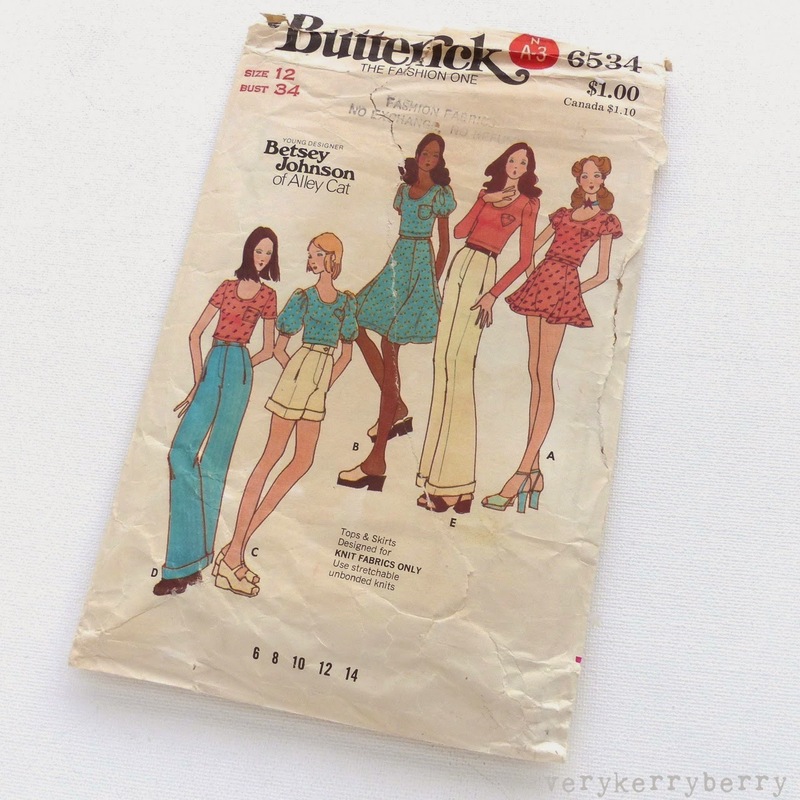 As a spur into action, I have been over to A Vintage Sewing Odyssey and joined in with The Vintage Sewing Pattern Pledge. 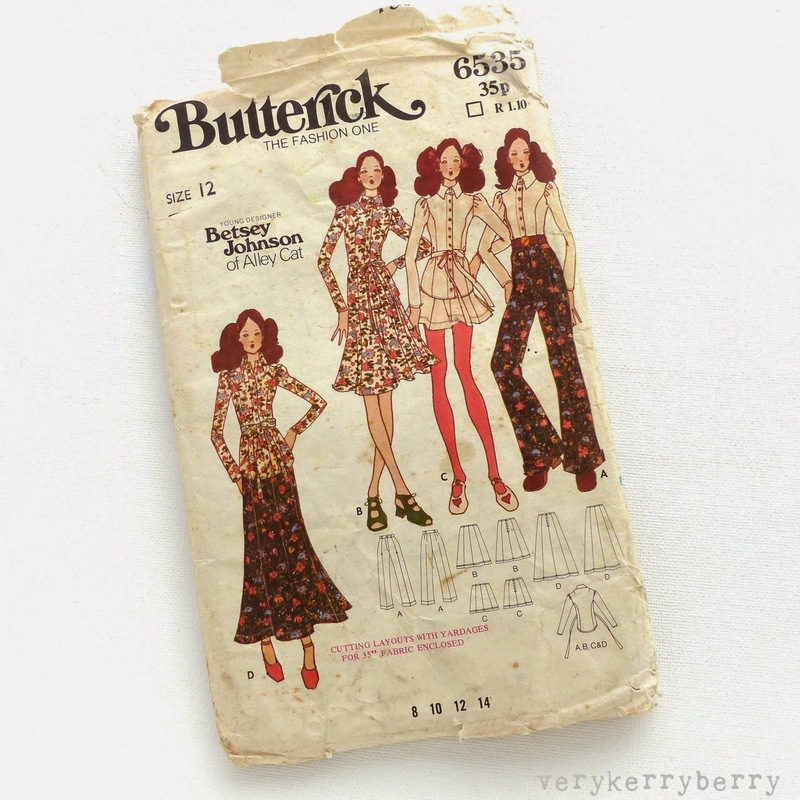 "I, Kerry of verykerryberry, pledge to make 3 garments from my Betsey Johnson 1970s pattern collection in 2015". Want to join? 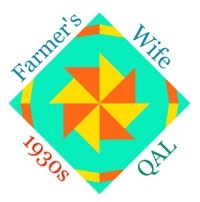 Visit Marie, or her co host Kerry of Kestral Makes to find out more. 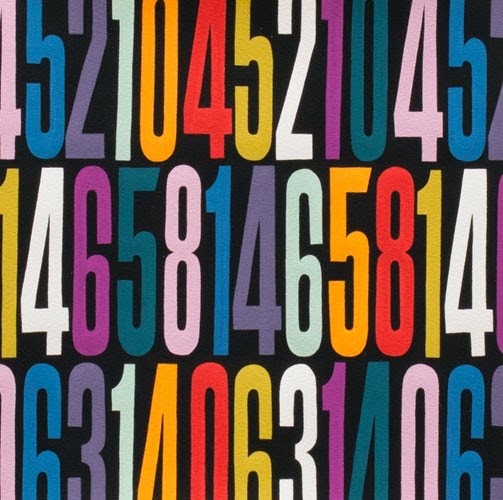 Alexander Henry, 'Count Down'. 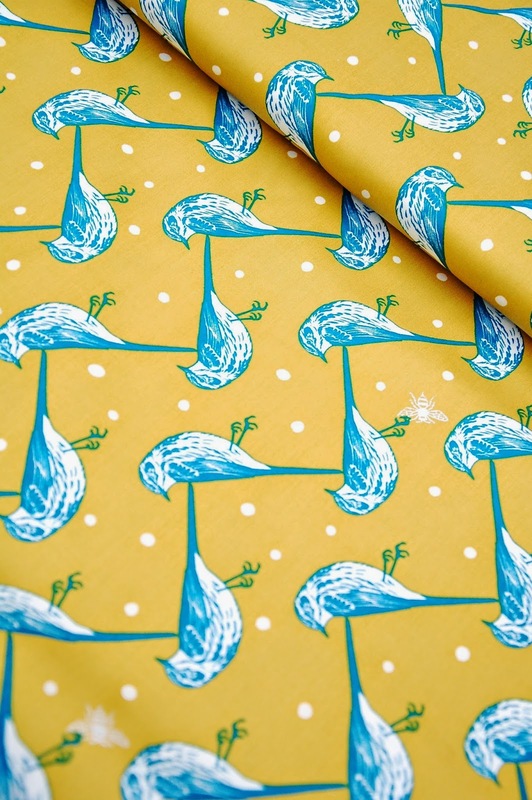 A reissue of a much sort after print from a few years back and a classic backing fabric which always makes me think of Amy Badskirt! 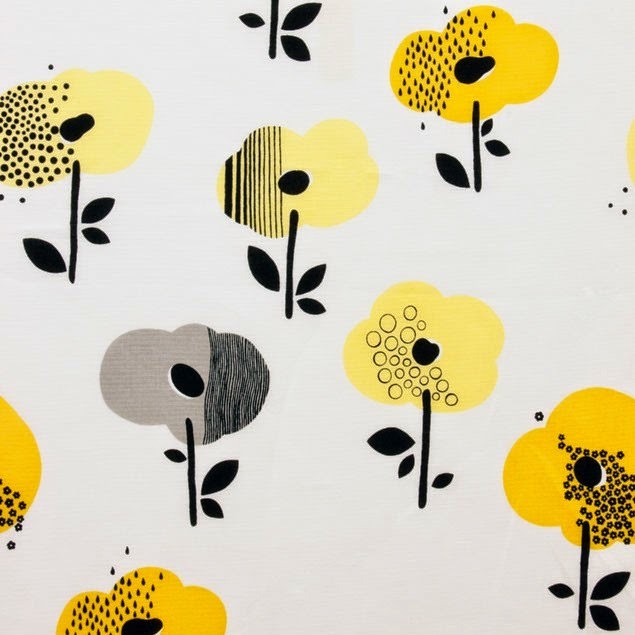 This large scale floral from Blend makes me think of Anna Maria Horner's Social Climber in Ice - a long gone favourite used especially well by Sarah Fielke on her Whirly Gig quilt in Quilting from Little Things. Turkish Delight floral seems like a good bargain substitute. 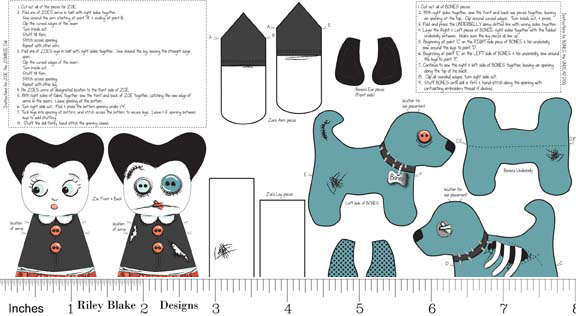 I like this cut-out panel as a project idea for tween age sewers and older of course, a Riley Blake Zombie Apocalypse panel to make your own zombie doll and accompanying zombie dog. 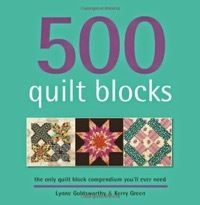 Instructions are even printed on the panel, an ideal project for those just starting out using a sewing machine, with a little adult help. You can find toy stuffing here. 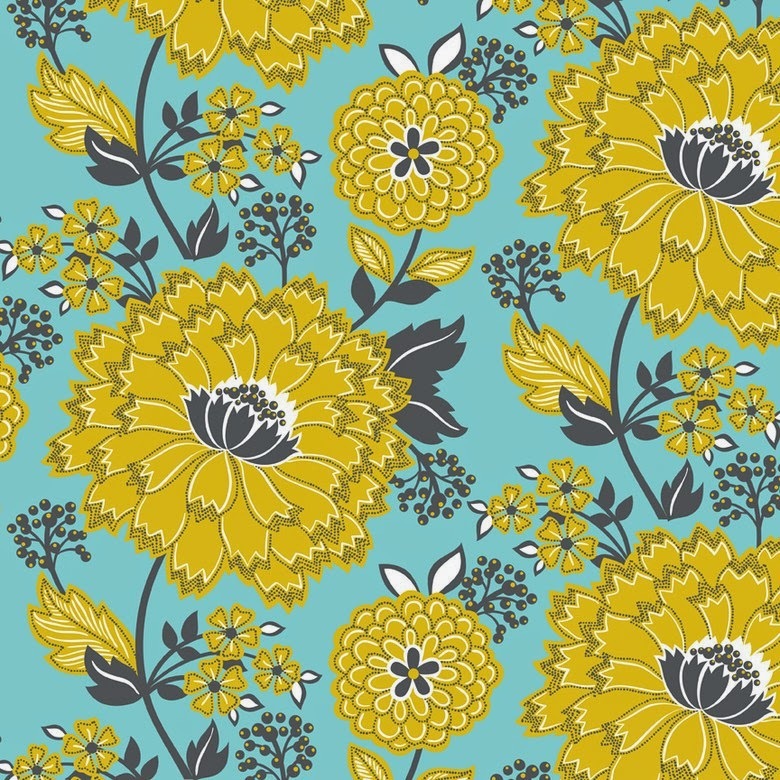 This jumbo floral print came out a couple of summers ago as part of the Mecca for Moderns collection 2013 and I remember loving it then and I still love it now, Alexander Henry, Broome Street Floral in yellow. Large mid century style flowers (5"/13cm tall). It would make lovely pillow cases. 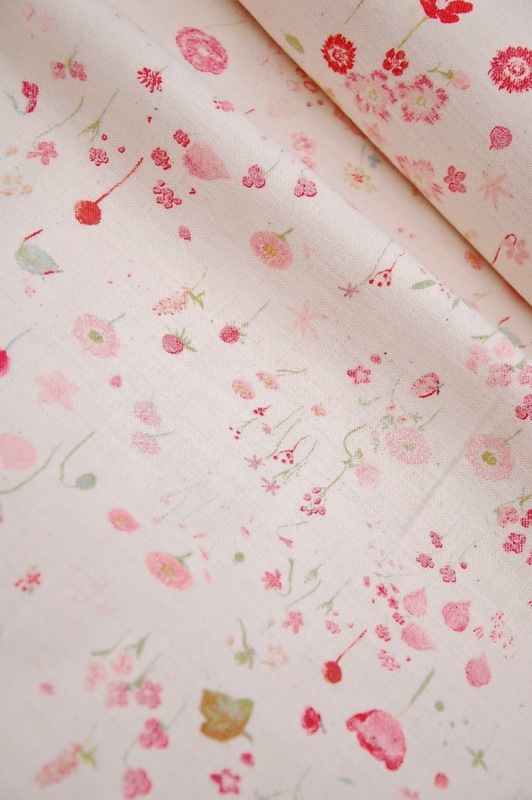 Another pretty large floral from Alexander Henry on offer is Larkspur Vivienne in Blush. 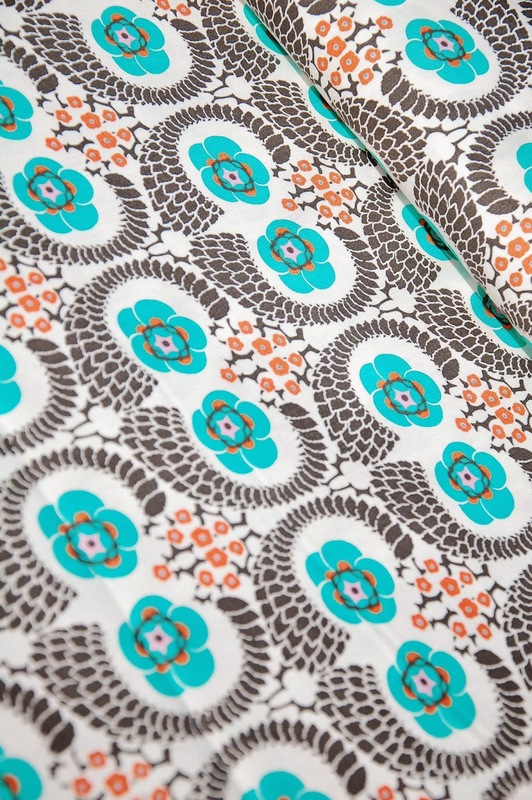 A great print if you are a fan of vintage sheet flowery designs. 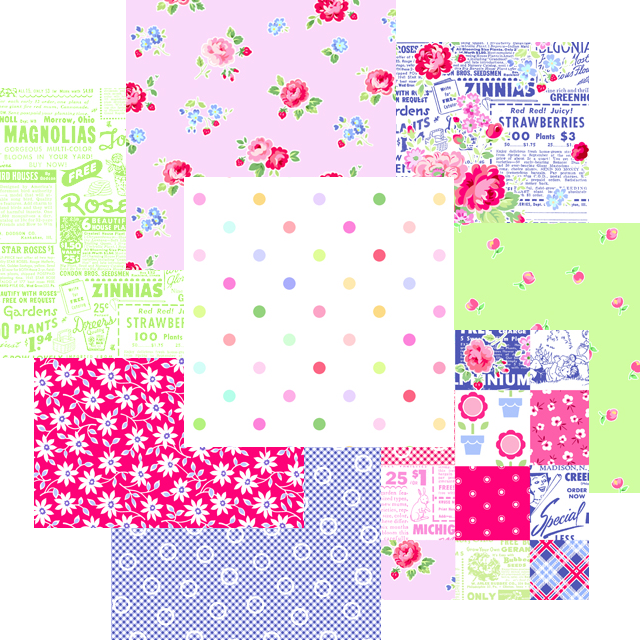 I think this would work well with Lori Holt's Flower patch range. There are so many great Alexander Henry prints in the sale. 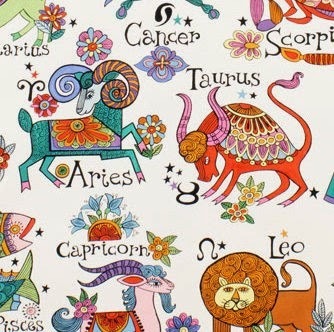 This zodiac print has a great 1970s vibe which reminds me of lots of ceramic designs from that time- for tiny curtains in a nursery maybe? 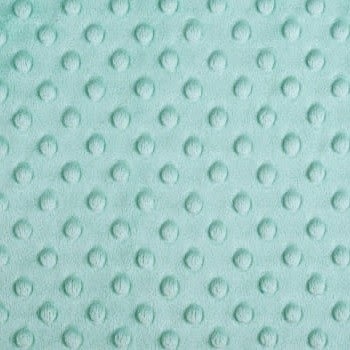 Other sale highlights include a range of Shannon cuddle fabrics, including dimpled and this Tiffany cuddle. In addition to the clearance bargains, you may find yourself tempted by the new arrivals. 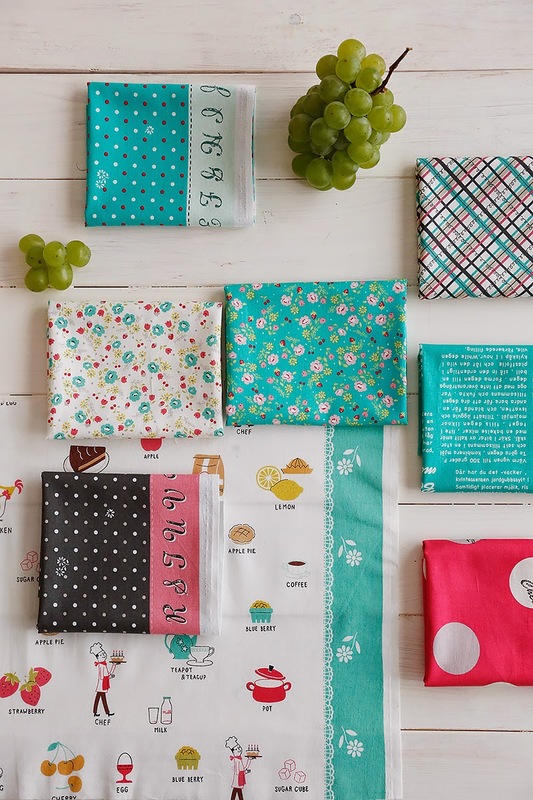 I spotted Sew Charming by Riley Blake. I haven't seen this range before and it is very appealing. Available as a bundle of six prints, or separately. Time for my February visit to The Village Haberdashery, and so still feeling the Valentine's groove, these are my current loves in store. 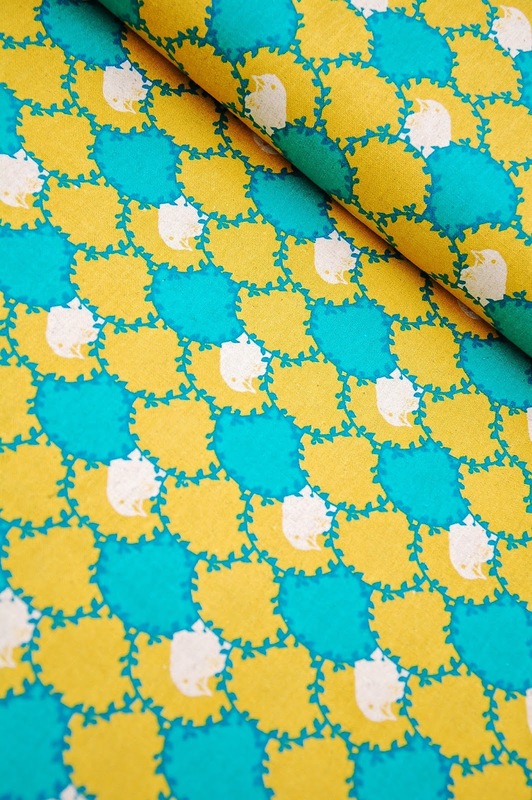 First, Ayumi's amazing first fabric line, Light Hearted for Kokka. This picture shows the mint colour way pretty accurately. The mint is a bright aqua with more green than blue. I am hugely proud of Ayumi for this line. Unbelievably, she doubted herself so much and it has proved incredibly popular, well before she revealed that it she was the designer. 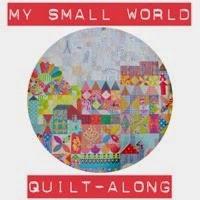 I think this is one of the first quilting cotton ranges for Kokka, what a great debut! The bottom right, Bamboo, is a metallic. 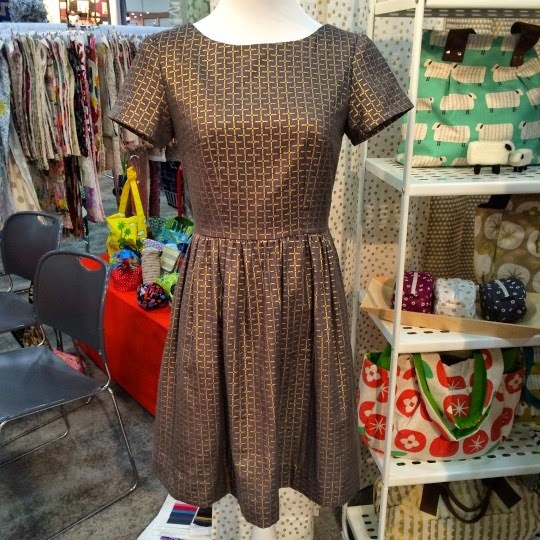 Annie snapped a picture of it made up into an Emery Dress (Christine Haynes' classic pattern) at Quilt Market. It always helps to see a fabric made up into something and in this photo you can see the shimmer and how the double gauze gathers beautifully for the skirt. 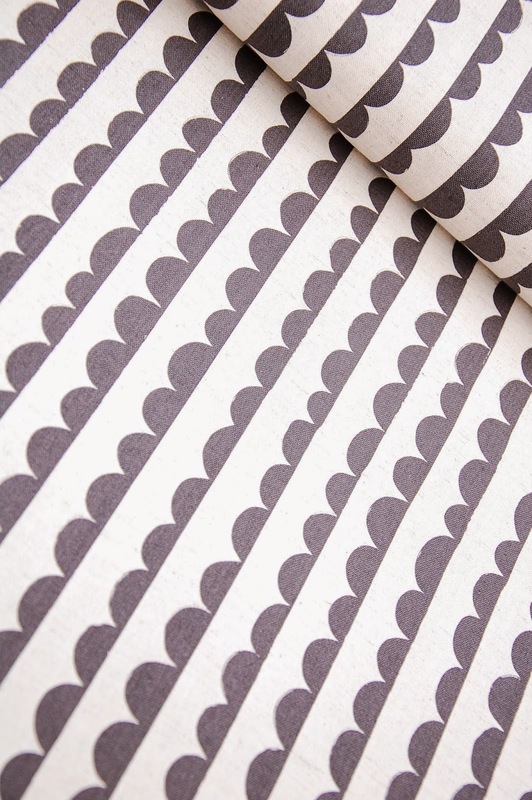 Jen Beeman's Grainline patterns are classic modern wardrobe staples. 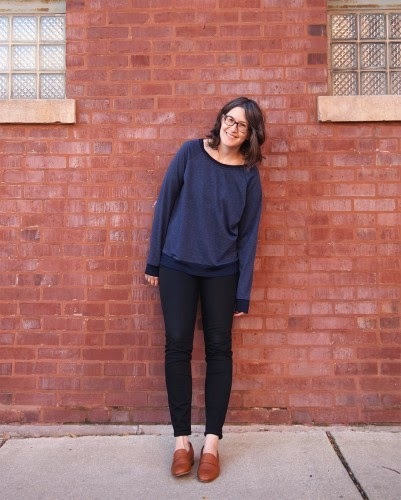 She designs comfortable unfussy clothes to wear everyday. The hugely popular Linden sweatshirt is in stock- for the moment, I think it will be snapped up super fast! 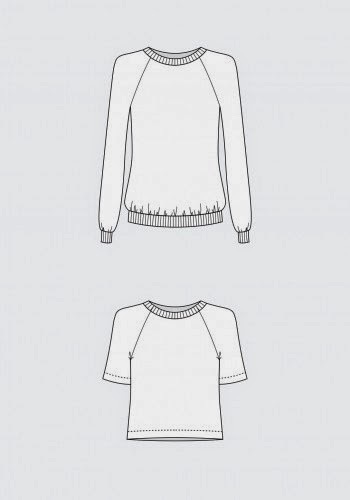 You can find sweatshirt knits here (the India ink is out of stock). I have some of the Rapture Rose and it is a glorious soft raspberry colour! You can find the accompanying wristband knits- an option for the neckline, cuffs and hem here. 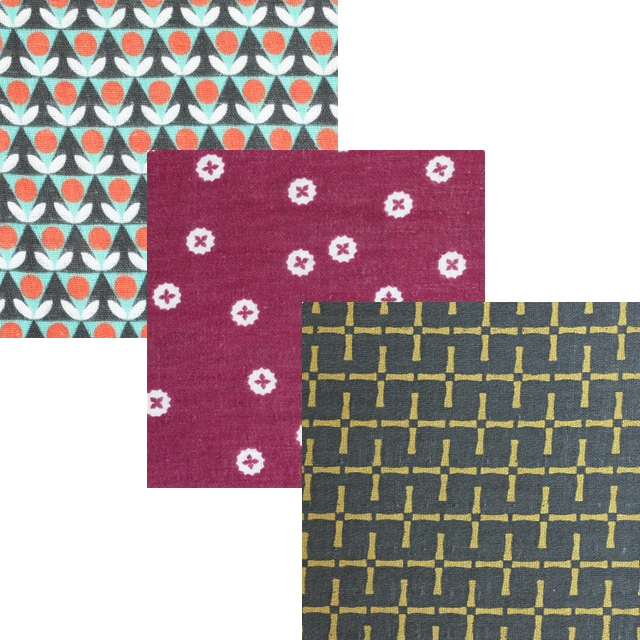 There are some beautiful wool based coat fabrics (super wide too!) in the shop that you could consider for your Cascade coat. 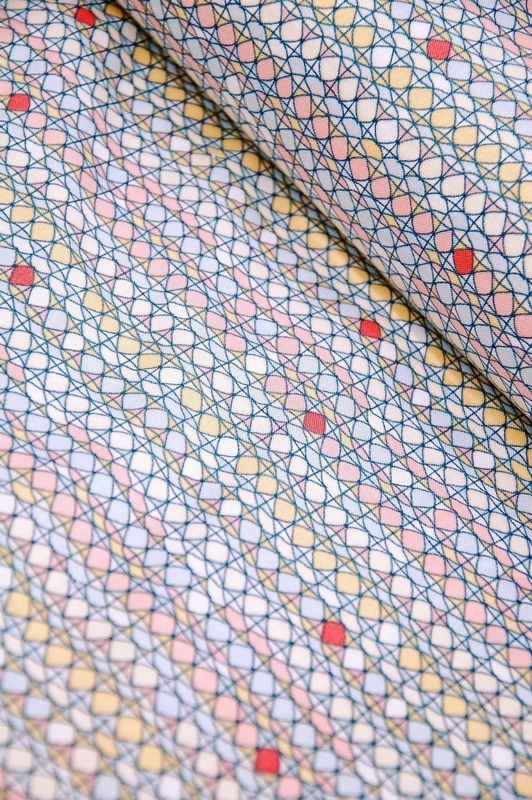 Left to right: Skinny Plaid, Herringbone and Pink stripe and Salt and Pepper. YOu can find lightweight, anti static lining fabric here. 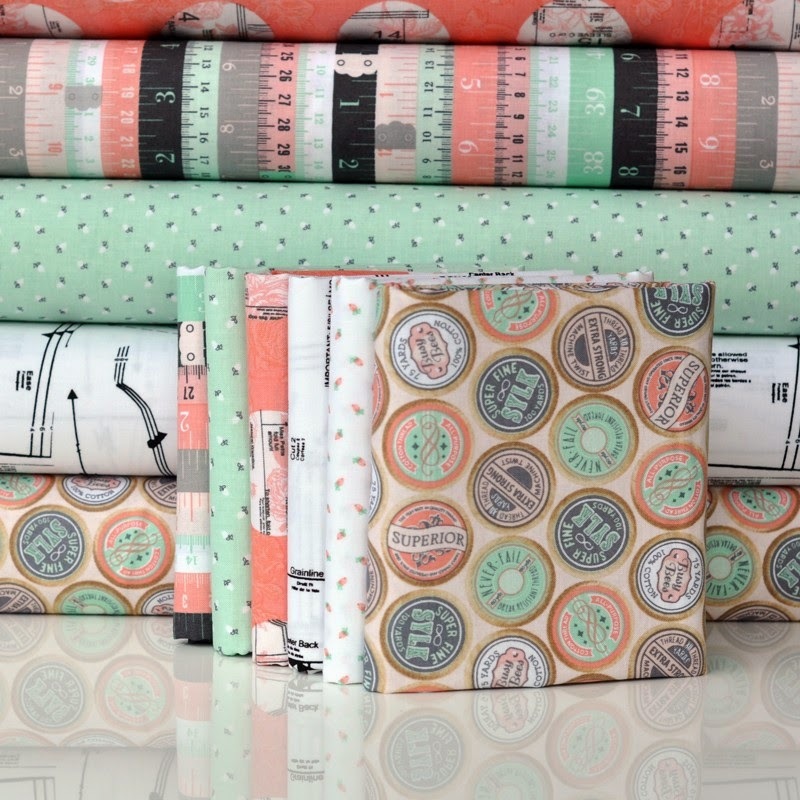 I've been crushing on this Time Warp organic bark cloth range by Jessica Jones for Cloud 9 since I first saw a peek of it. Its a heavier fabric- think home dec weight/canvas weight and has a textured finish. 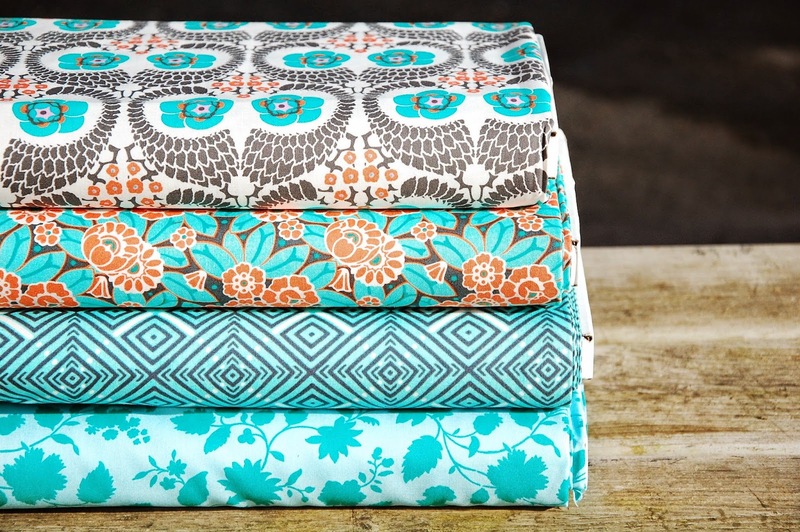 Great for bags and pillows but also suitable for jackets or even a structured dress. Annie took another quilt market snap of the fabric in use which shows you how it looks in use. 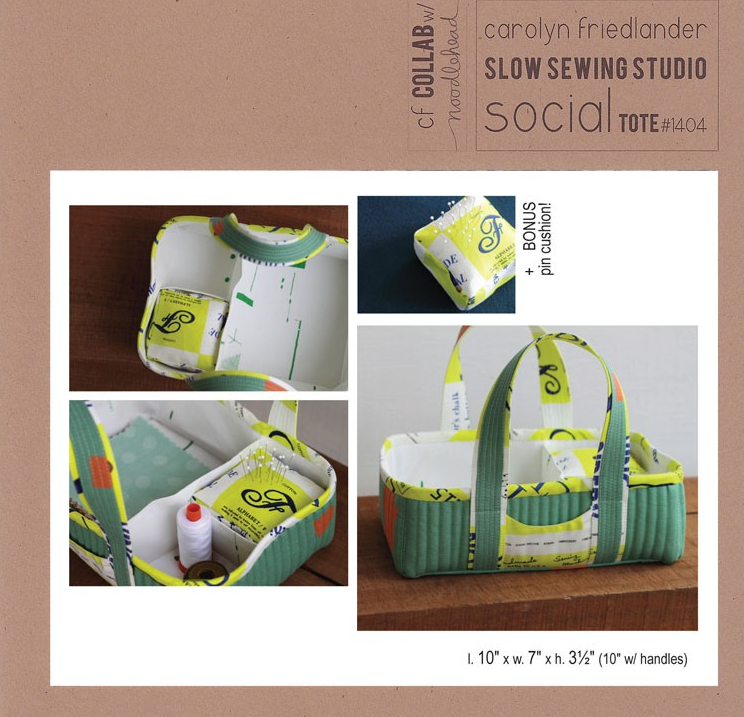 I'm finishing with a pattern that I noticed has sneaked its way into Village Haberdashery that I haven't seen stocked in the UK before, The Social Tote by Carolyn Friedlander and Anna Graham of Noodlehead.